“Today’s kids have it too easy!” and “Kids were more respectful when I was in school” are two sentiments I routinely hear bandied about whenever the topic of adolescent behavior pops up. This type of thinking suggests two things. First, today’s society coddles children. Second, schools are failing in their duty of producing well-mannered (white/middle class) children. Be more strict and children will fall in line. The implication here is that struggling students can be either punished or incentivized out of misbehavior. Schools often deal with struggling students by employing the crude language of rewards and punishments. If you show X amount of behavior Y you will receive the reward of Z. Stop talking so much and you’ll get some pizza. Cooperate more with others and earn a star. This is all pretty standard stuff and anyone who has worked in a school should be well-versed in behavioral improvement plans. That’s the problem. Teachers are well versed in this stuff because it’s become enshrined in our school culture. Teachers will also tell you that it doesn’t work. Students put on these types of plans often come from homes with fewer resources and smaller support networks. I became interested in this subject after reading the excellent book Engaging Troubling Students by Scot Danforth and Terry Jo Smith. The book lays out a history of juvenile delinquency in order to provide a better alternative. I decided to synthesize Danforth and Smith’s opening section on disruptive behavior. Disruptive student behavior has been around forever. Schools in the 19th century would often solve conflicts between teachers and students by actually fighting with bare fists (It’s true! Check out Dave Tyack’s One Best System). Danforth and Smith argue that while student disruption hasn’t changed over time, the ecology of the struggling student (the societal/familial/educational conditions) has. By the 1900’s, the Common School movement had largely succeeded in placing most white children in some sort of publicly funded school. Academically, these schools favored Eurocentric humanism. Think Greek, Latin, belles-lettres, and the Western canon. In terms of behavior, turn-of-the-century American schools worked to inculcate students with Protestant values of hard work and obedience. As I’ve mentioned in previous posts, the dawn of the 20th century was an extremely tumultuous time in American history. Massive immigration, technological growth, and the rise of mass media led to a society in flux. Engaging Troubling Students locates the birth of juvenile delinquency in the crowded industrial ghettos of the growing American metropolis. City schools found themselves filled with students who knew little of American cultural mores. Politicians scrambled to bring unruly immigrants into the fold of decent society. The first group to respond to the problem of juvenile delinquency was the child-savers. Child-savers were wealthy, white, educated women who viewed struggling children as the result of “complex social and political problems requiring intervention at many levels” (16). Key here is the notion that child-savers conceptualized deviance as a largely social problem, not an inherently individual problem. Struggling children weren’t necessarily seen as defective or malignant; their behaviors were a response to the inequitable realities of daily living. Social prejudices, unjust laws, and unsanitary living conditions don’t exactly set children up for success. So to combat this, child-savers attempted to improve the living conditions of the urban poor. They worked to increase access to health care, expand public welfare programs, and lobby the government for safer working conditions. According to Danforth and Smith, all of this began to change in 1915 after physician William Healy published a book called The Individual Delinquent. Healy argued that while social and cultural factors may indeed play a role in behavior, defective character was inherently individual. Early mental health practitioners and politicians seized on Healy’s thesis. The public imagination began to see delinquency as a problem of poor psychological adjustment. Society needed to pathologize and treat the individual rather than focus on issues of social inequality. This change in diagnoses required a change in treatment. The helping professions, psychology, psychiatry, and social work, stepped in to tackle the problem. Psychology and psychiatry used the new advancements in science and technology to refashion themselves as the official technicians of the brain. By allying their field with modernism’s unwavering faith in science, the new helping professions were able to expand their reach beyond the walls of the institution and into the homes of individual families. 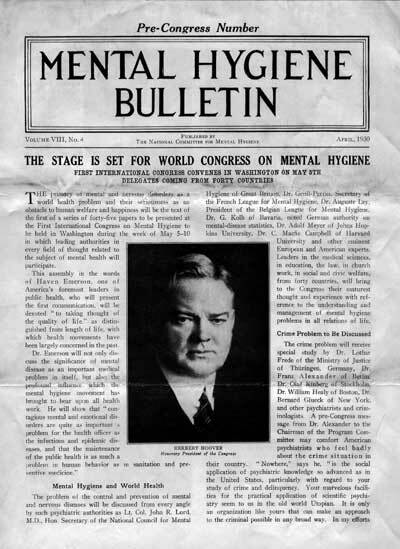 The mental hygiene movement (1890-1945) created a definition of juvenile deviance and troublesome behavior as an illness of the individual to be treated through pharmacology and medical intervention. The legacy of the mental hygiene movement is an unwavering focus on the individual. Protestant values of submission to authority and the need to work hard were refurbished, “stripping away Christian references while primarily upholding the same middle-class norms of behavior and attitude” (23). During this time, many public schools created special classes and remedial tracks for immigrant and unruly children. The burgeoning mental measurement movement (beginning with the appearance of the IQ test on the international scene) added scientific legitimacy to notion that certain children were just bad. The next boon for classifying and diagnosing childhood misbehavior came in 1966 with the publication of Psychological Disorders in Childhood: Theoretical Considerations and a Proposed Classification by the Group for the Advancement of Psychiatry. Think about it as the precursor to the DSM-V. Mental health professions now had a comprehensive, formalized set of diagnoses to use on children. Engaging Troubling Students end their brief history of juvenile delinquency by exploring the rise of special education programs in post-War America. “Types of disability were ‘diagnosed’ through the use of ‘objective measures’ and ‘clinical judgment'” (26). Social institutions rushed to categorize and label children. Education programs were framed as treatments. Federal legislation during the 1960s and 1970s spurred dramatic increases in the amount of children labeled as disturbed and the amount of teachers assigned to work with such students. Since then, the amount of children diagnosed with Emotional Disturbance (ED), Oppositional Defiant Disorder (ODD), and other disabilities has skyrocketed. So how could schools cope with exploding populations of children with behavioral problems? Enter the rise of behaviorism. Behaviorists reduced the inner complexity of psychological life to a mechanistic process of external stimulus and response. For behaviorists, the key to improving troubling students was a matter of finding the right rewards and punishments. No lengthy interventions and no complex talk therapy. Schools rushed to devise systems of incentives to encourage desirable behaviors and punishments to extinguish behaviors considered problematic. This system should be instantly recognizable to anyone who has worked in a public school. Let’s sum this up. The technological, cultural, and historical patterns of the 19th and 20th centuries disrupted American life. Schools and the helping professions of the early 20th century responded to this disruption by attempting to inculcate dominant middle-class values of hard work and submission to authority. Students who struggled were labelled, tracked, and treated through increasingly scientific and technocratic programs. Larger cultural trends shifted blame from inequitable social institutions to the individual. As the population of struggling students grew, schools looked to the emerging field of behaviorism for help. The ease of incentive plans and behavior intervention programs cemented their place as the dominant mode of conceptualizing and interacting with juvenile misbehavior. Ok, so if behavior improvement plans are ineffective, what’s the alternative? My next post deals with Danforth and Smith’s recommendations for implementing social constructivism in schools. This post will run through KWR’s comments on each step. -Always be on the lookout for possible mentor texts. Always read like a writer on the lookout for something class-worthy. KWR recommends keeping hard copies of everything in a large binder. -Length is part of the inquiry. Once you’ve gathered a good stack of a certain kind of writing, one of the questions you’ll ask is ‘How long are these?’ That way you and your students can discuss length in an authentic manner. -Look through magazines (KWR recommends (USA Today), magazines (Muse, U.S. Kids, American Girl, Boy’s Life, Cobblestone, Click), picture books, the Internet (Rotten Tomatoes, East of the Web), and more. -Make sure that children examine the graphical layout of a text along with its content. -Go for breadth (enough examples so students can see a good range of writing in the world) and depth (a few texts that anchor the study, select these with care). -Use authentic texts, not writing created for schools (textbooks). -Go for high interest. Invite students to help you find them. Keep an editable Google Doc, perhaps. -The text must be at least semi-readable. -Each text must be a wonderful representative of the genre and pregnant with opportunities to study content and craft and process. -The goal here is to establish predictable routines. Each study starts with a short stack of texts that show writers doing whatever it is you want to study. -Make sure the students understand that you will expect them to finish a piece of writing that shows influence of the study. -Students need to have routines down pat. Think about beginning of the year mini-lessons that help students know how to research, get in and out of groups, collaborate, confer with teacher, and use independent time wisely. -Preview texts, read a mentor aloud, talk with students, chart things. 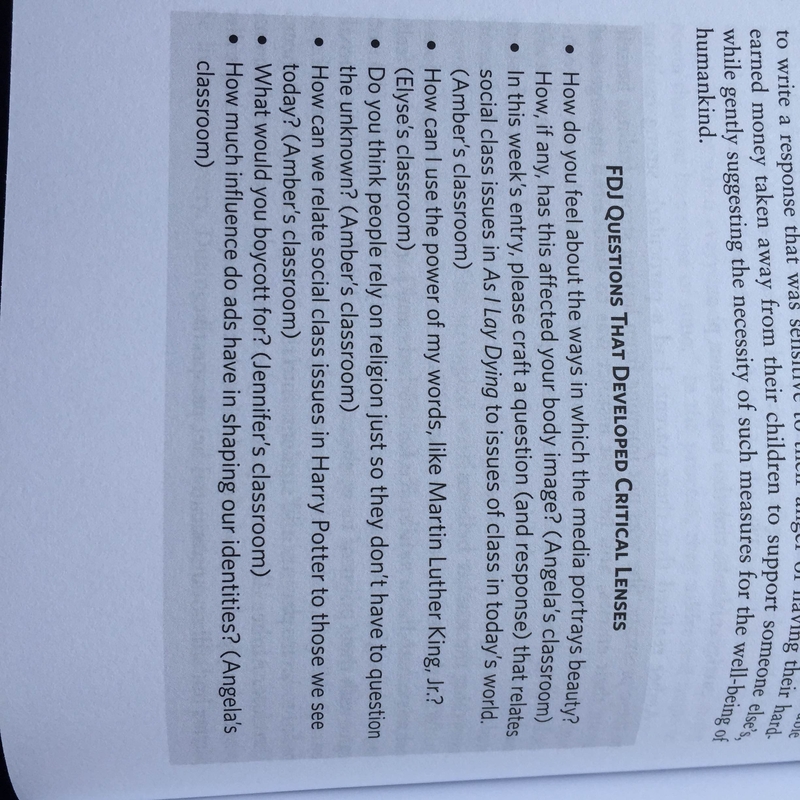 -From their first encounter with the text, you want students thinking, ‘I’m going to write something like this.’ This is key. -First off, students should read what they want to read during independent reading time. Immersion in a genre is for specific times when you expect students to partake in intentional reading. -Plan ahead of time how long the immersion phase will last. 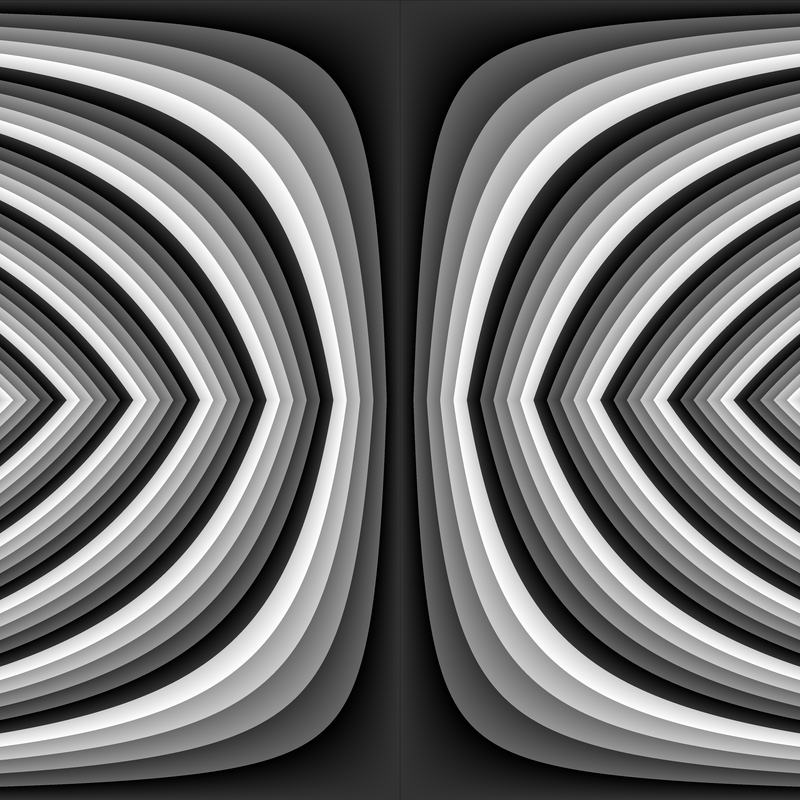 Typical immersion time goes from a few concentrated days to a week(s). 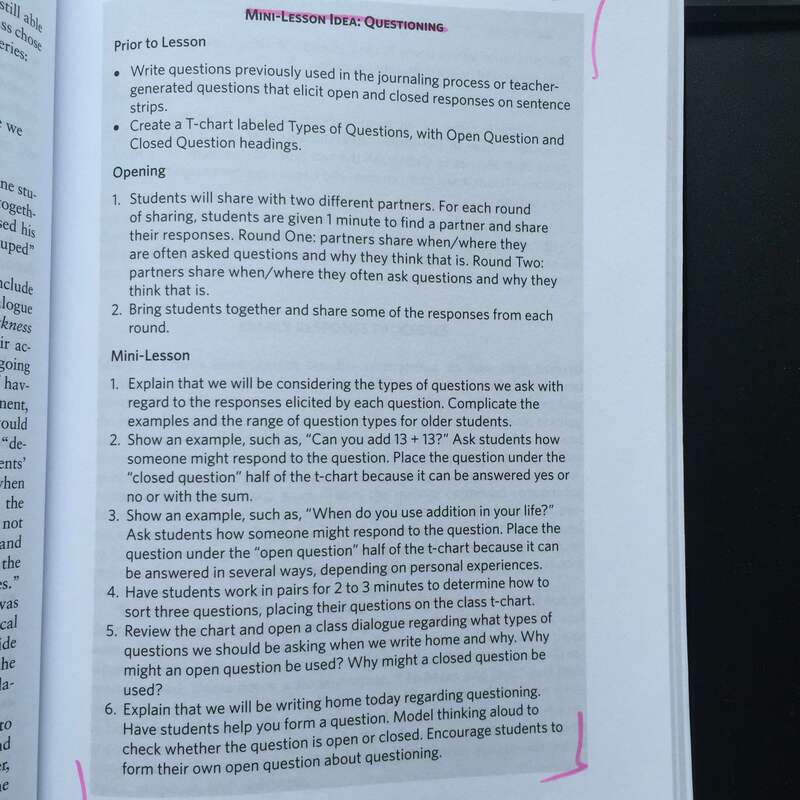 -Create guiding questions! 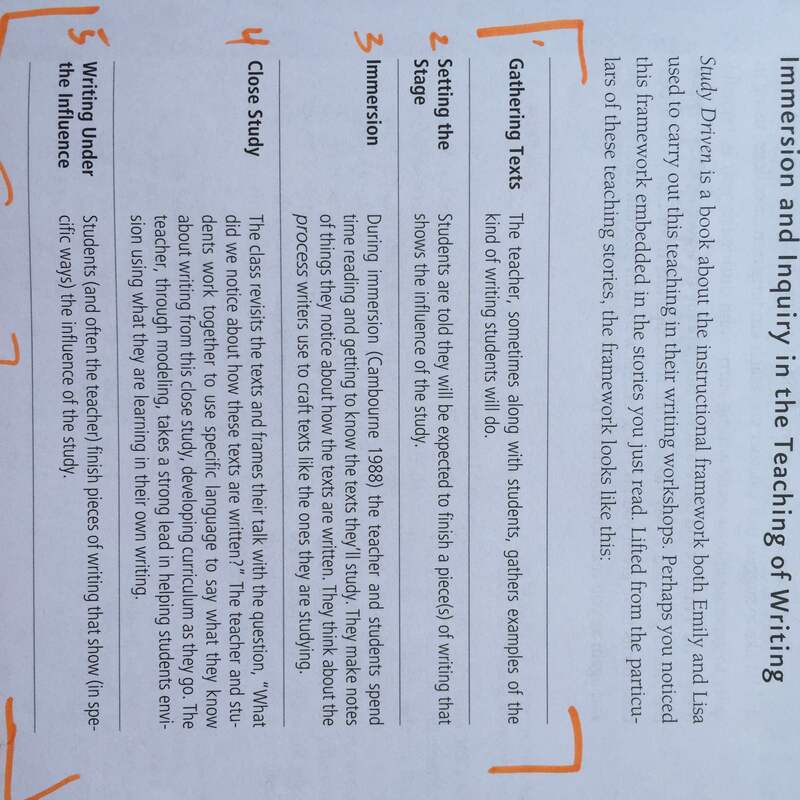 As students read, you want them to begin making notes of things they are noticing in response to the text. If you’re in a craft/process unit, your questions will be narrow: how do writers use punctuation in powerful ways to craft their texts?, for instance. If you’re in a larger genre study, then go with the same three questions: What kinds of topics do writers address with this genre and what kinds of things do they do with these topics?, What kind of work (research, reflecting, etc.) does it seem like writers of this genre must do in order to produce this kind of writing?, and How do writers craft this genre so that it is compelling for readers? 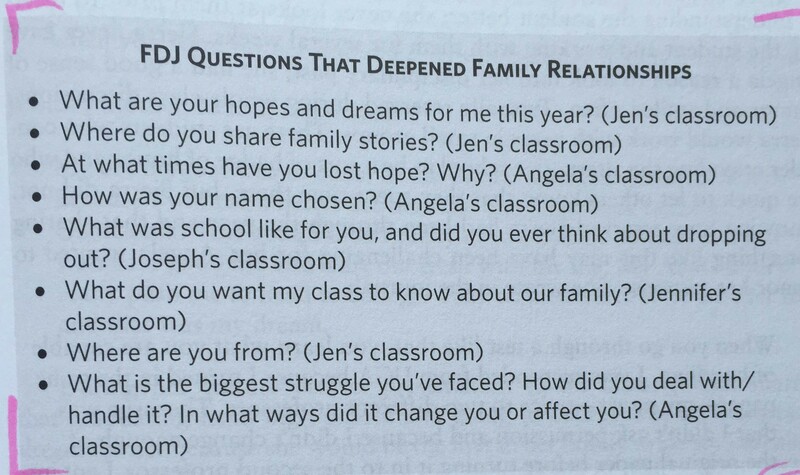 -Remember, you are teaching students to go through this line of questioning for everything they read. -Students can write down their noticings on the text, on charts, on sticky notes, in their writer’s notebook, etc. Consider charting the whole-class discussion yourself. 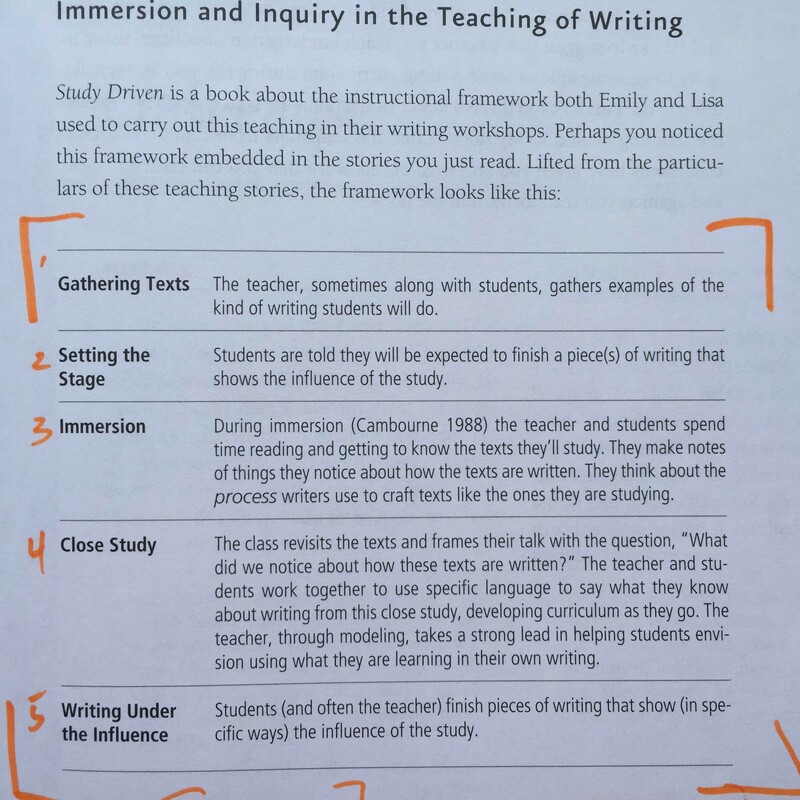 -After reading deeply and widely in immersion, it’s time to dig in with your students and become articulate about how writers craft this genre so that it is compelling for readers. -Just like with the Immersion phase above, have a plan in mind for how long you want the Close Study phase to last. If you don’t set a limit, it’s easy to get lost in this phase. KWR recommends at least a few days. -Remember, the point is to get students Writing under the Influence (see below). 1. Working from a whole-class list of student noticings across texts: Make a giant list together and select an issue or two from the list. You won’t know exactly what it is until you’ve done it with students, so take the leap of faith. 2. Returning to individual texts for close study: Spend a few days as a class on a single text. This means the text must be “teaching full” and able to carry the weight of lengthy discourse. -Set a date when you want students to begin their Writing under the Influence draft. -Writing workshops include significant stretches of time when children work independently as writers. They shouldn’t be spending all of the time on their “main” draft. -Balance “main” drafting with independent writing. -Students need to do as much talking and visioning as possible before they begin writing under the influence. 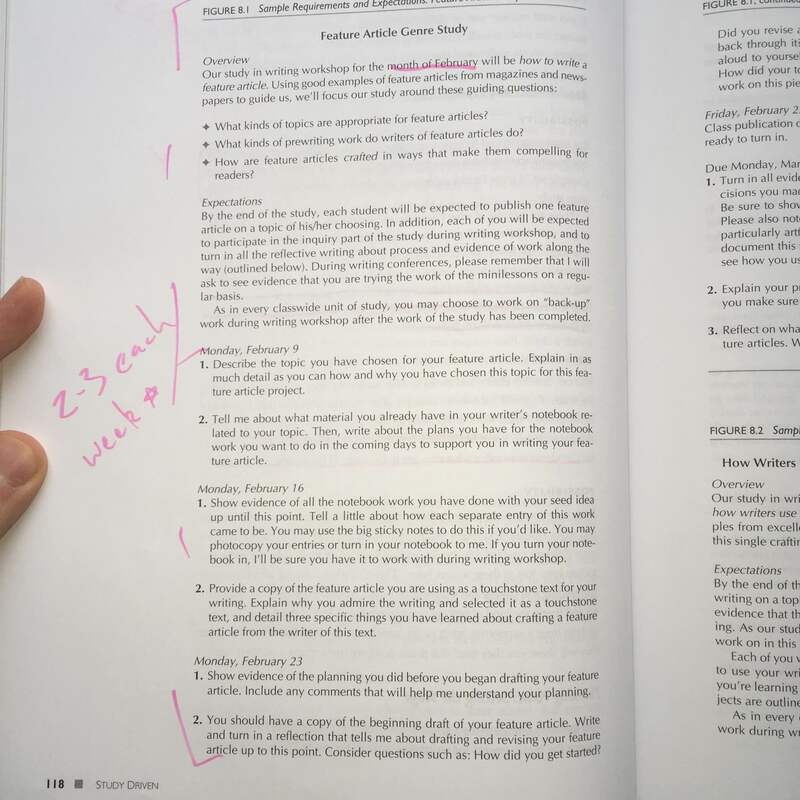 -Make sure students have what KWR calls “back-up work,” other pieces of student-generated writing that they can return to whenever they’re stuck, bored, etc. BUW is anything a student wants to write. The bigger the better. You don’t do much with BUW. -Make sure students show a record of their process. Have students reflect on what it is they’ve done, how they’ve done it, what craft and process growth they’ve made, etc. This is essential! -Revision and editing should only take a few days at the end. Focus on the issues you’re seeing during your conferring. -Today’s draft can become next unit’s BUW. That concludes the summary of KWR’s five-step Inquiry process. I’m going to include additional pertinent information below. Evaluation: Remember, teach the writer, not the writing. -Think about asking students to show evidence of: working through the process (evidence of work spent wisely, attention paid to dates), choosing and growing an idea (evidence of deliberate topic selection, using the writer’s notebook to grow an idea, etc. ), drafting and revising (evidence of thoughtful planning for drafting, being engaged in purposeful revision, etc. 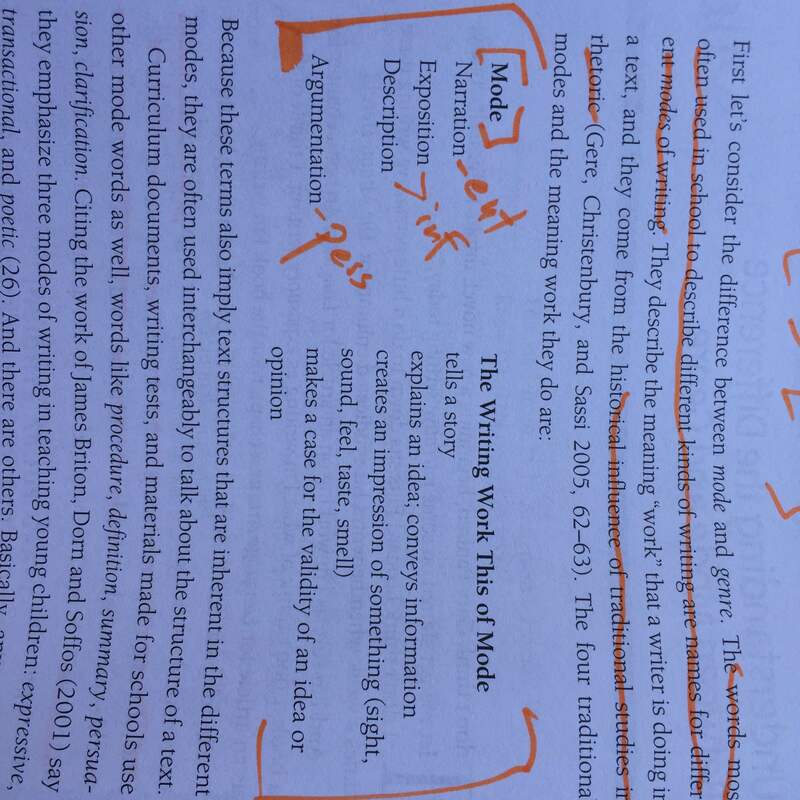 ), and finishing (evidence the writer paid careful and strategic attention to spelling, etc.). -Students need to live through the writing process (planning, drafting, revising, editing, publishing) many times throughout the school year. They should be talking about their process and writing about their stories of writing like a writer. 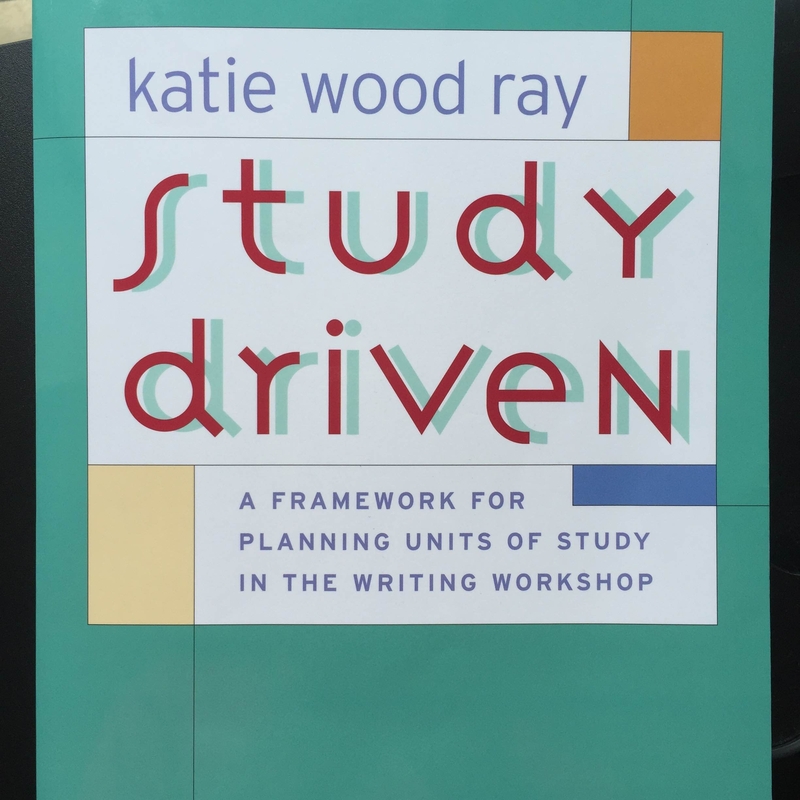 -Consider units of study on the process: using talk as a tool to improve writing, where writers get idea, using a notebook as a tool to improve your writing, what writers think about and do during revision. -When planning for a process study, use a similar format of immersion, close study, and writing under the influence. Students can work on any genre as long as they’re immersed and under the influence of a particular process question or aspect. -The Internet is a great place to find interesting quotes and anecdotes from writers about their own craft and process. 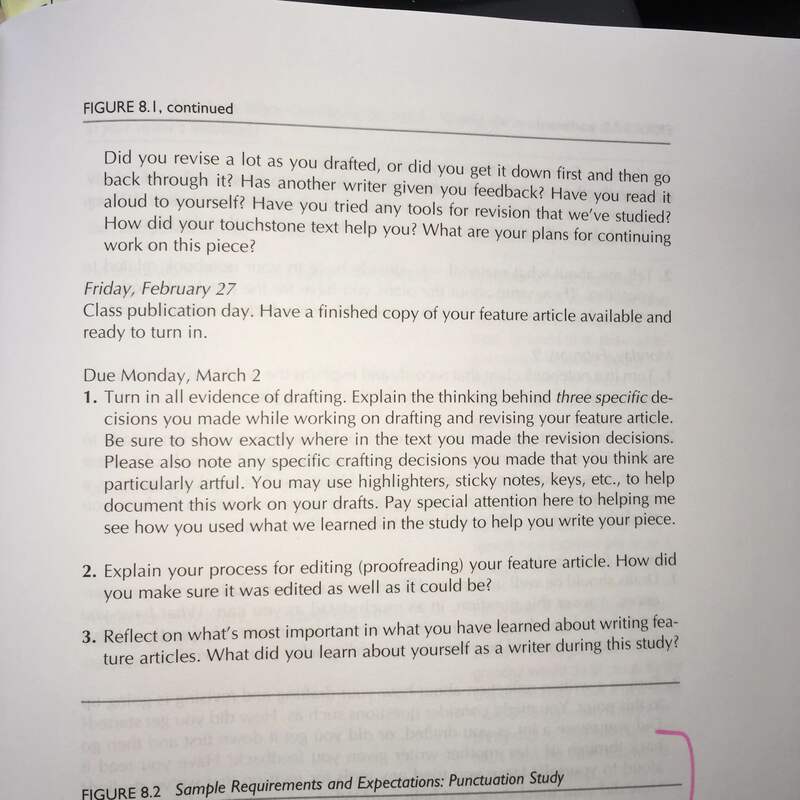 -Just like in a product study, give students an assignment sheet up front with the expectations and dates. -This method requires the teacher to create a new order of experience, a new curriculum that comes from the students. -Use their talk to find your content. For instance a student observation about illustrations turns into a piece of curriculum on how writers should think a lot about the placement of text with illustrations. -What you study comes from what they notice. This is essential (and perhaps the hardest part). This book is amazing. It’s one of the most effective professional books I’ve ever read. KWR weaves in theory, philosophy, activism, and pragmatism into a single book. I cannot recommend this enough! 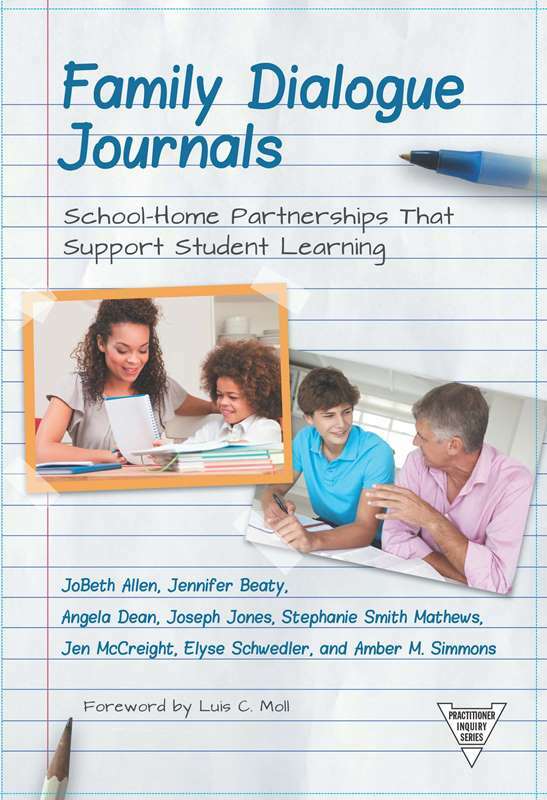 In addition to housing mentor texts, this website is also regularly updated with new material. In fact, KWR Tweeted that many people will be adding to the mentor text list starting in the end of August.